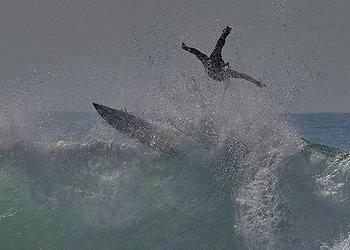 LOS ANGELES, California, August 28, 2014 (ENS) – High waves generated by Tropical Storm Marie hammering Southern California beaches turned fatal on Tuesday. An unconscious surfer rescued from the turbulent waters near Malibu Pier was later pronounced dead after Los Angeles County lifeguards tried but failed to save his life. The pier was later closed after a piling was loosened by the giant waves. Officials have repeatedly warned members of the public to stay away from the huge surf. Strong waves of 10 to 25 feet battered the California coast from Santa Barbara County to northern San Diego County all day Wednesday, continued today and are forecast to persist through Friday. The National Weather Service has issued a high surf warning, saying the highest surf will impact beaches from Long Beach through the Palos Verdes Peninsula, including Cabrillo Beach and Point Fermin as well as Malibu and Zuma beaches. Nearly 175 swimmers had to be rescued in Los Angeles County on Wednesday, KTLA-TV in Los Angeles reported. Among them, four Newport Beach lifeguards were rescued after attempting to rescue a body-surfer in distress in waves up to 25 feet. All five men were rescued by boat. In Seal Beach, storm surge flooded ground floors and basements Tuesday and Wednesday, although crews sandbagged near-shore areas. 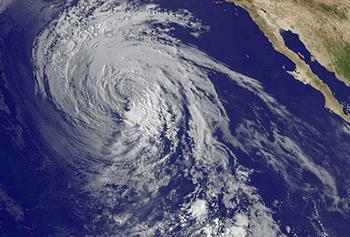 On Sunday, Marie became the strongest hurricane over the eastern Pacific since Hurricane Celia in 2010, a Category 5 hurricane packing winds of 160 miles per hour. Marie now has weakened to a tropical storm and is forecast to gradually weaken through the rest of this week. Although the core of Hurricane Marie stayed offshore, heavy rains in Oaxaca, Mexico Monday caused flooding and landslides in the districts of Juquila and Pochutla. Five people were swept away by a swollen river; all were wounded but later rescued. Part of Federal Highway 200 and a bridge were closed. At least 10,000 people needed help and a disaster declaration was requested for the state of Oaxaca. Storm surge in Colima destroyed four buildings and damaged 10 others. Flooding along the Marabasco and San Nicolás rivers claimed two lives. Minor flooding also occurred in near Acapulco and in Colima. In Guadalajara, numerous trees were downed and shops were closed. Off the coast of Los Cabos in Baja California Sur, large swells capsized a fishing boat with seven people aboard on August 25. Four swam to shore, but the others remain missing. Strong rain bands along the outer fringes of Hurricane Marie caused landslides that blocked several roads near Los Cabos, while gusty winds toppled trees and power lines.